As we mentioned a couple of weeks ago, there are now a number of cycleway projects under construction or out for consultation. One of those in the latter group is the Quarryman’s Trail, stretching from central city all the way out to Halswell. You can now have the chance to have your say on the proposed route and design features. The route is a mix of shared paths, neighbourhood greenways, and separated cycleways, depending on the nature of the corridor. Because the route has busy roads for much of the way, separated cycleways are used a lot, some one-way on each side and some two-way on one side. There are a number of new signalised crossings and intersections (seven in total) where needed to help riders get across, as well as a number of upgraded existing signals (three). These will have dedicated signal phases separating cyclists from turning traffic. The route starts in Halswell at the new Te Hāpua Community Centre and then heads north along Halswell Rd and into Halswell Domain by means of a 3.0-3.5m shared pathway. Not clear though why the route couldn’t go more directly across the Domain through the middle (near the football club) instead? On the other side it comes out at James Hight Dr and continues as a neighbourhood greenway along there (including a 30km/h speed limit). Once at Milns Rd, the cycleway will cross over to follow the Milns Drain Reserve, where the existing gravel path will be sealed and widened to 3m. This will lead riders to Sparks Rd where the shared pathway will continue alongside the road towards town. Already there have been some questions asked about how people trying to get to/from Halswell Quarry (and surrounding mountain-bike tracks) might access the cycleway from here (it is called the Quarryman’s Trail after all…). Widening the shoulders along Sparks Rd to provide proper cycle lanes would be a good start. The 3m-wide shared pathway continues along Sparks Rd towards Hendersons Rd. At this intersection, the existing roundabout will be converted to traffic signals, and feature an interesting diagonal crossing to take the cycleway from the north side to the south side of Sparks Rd. It’s not clear how you might turn right onto the cycleway from the Hendersons Rd legs though. The two-way cycleway continues on the southern side of Sparks Rd into town; parking is removed from this side of the road and there are regular gaps in the separator should you need to access the properties opposite. There are also refuge island crossings to access the side-roads opposite. Things get a bit restricted once back into suburbia however, with the cycleway only being 2.5m wide – surely those traffic lanes could be squeezed a little more? 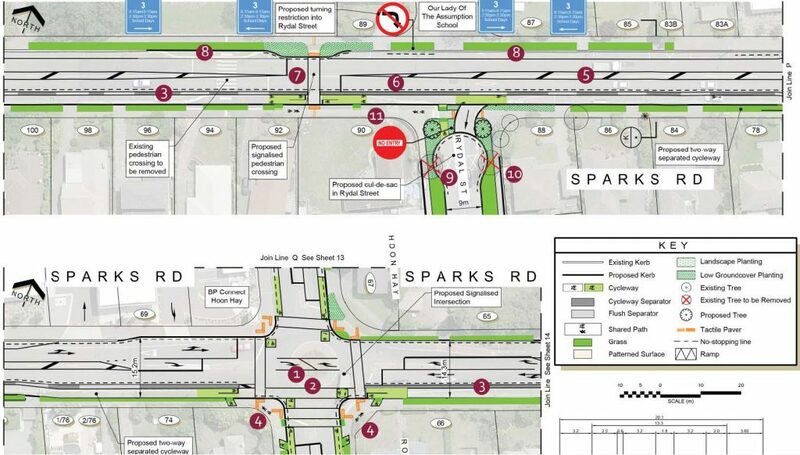 Two-way cycleway along Sparks Rd – but is it wide enough? At Hoon Hay and Our Lady of Assumption Schools, a signalised pedestrian crossing is provided, which presumably would also allow cyclists to get across. Then the roundabout at Hoon Hay Rd is replaced by new traffic signals; interesting to note some off-road cycle bypasses on the southern corners. The two-way cycleway (thankfully restored to 3m wide now) continues along Sparks Rd towards Lyttelton St. The roundabout there is also being signalised to get riders easily over to Frankleigh St. Beyond Lyttelton St, a number of different routes were considered towards the city. They ranged between Barrington Park in the north, along Milton St, and Studholme St/Somerfield Park in the south. In the end, the decision was made to use Roker St as a neighbourhood greenway route from Frankleigh to Strickland. That requires a signalised crossing across Barrington St and property purchase to create a path link through to Roker. Roker St will have additional speed humps and a 30 km/h speed limit to make it friendlier for cycling on. Hopefully it will also has some good connections to key destinations nearby, including Barrington Mall, Barrington Park and Chch South Intermediate. 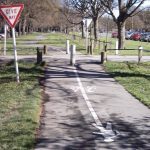 A friendly route to cycle on – but what does it connect to nearby? At Strickland St, a new signalised crossing connects the Roker St route with Bradford Park. In the near future, the Southern Lights major cycleway will head south from here. For now, the Quarryman’s Trail continues north up Strickland. Along Strickland and Antigua Sts, one-way separated cycleways will be provided on each side of the road. This will mean removal of parking on one side of the road, which will no doubt cause a bit of angst to some. 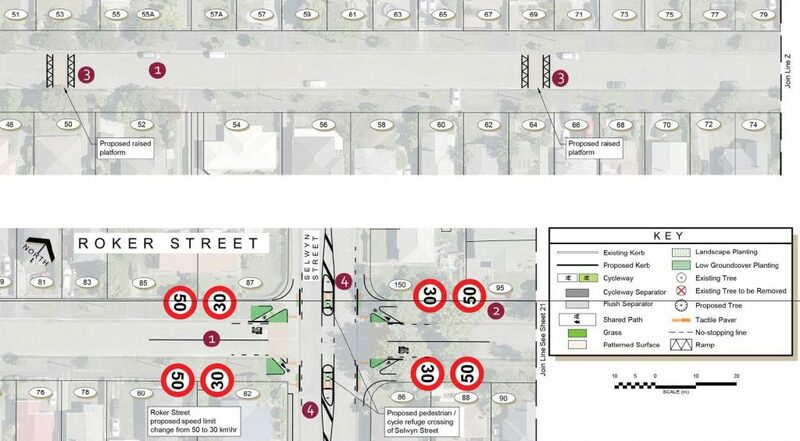 Upgraded signalised intersections at Brougham St and Moorhouse Ave are joined by a new signalised intersection at Disraeli St. As with many of the new cycleway intersections around town, the signal phasing will separate cycle movements from turning traffic, to minimise conflicts. Overall, this route will provide some greatly improved cycling between Halswell and other south-western suburbs towards town. 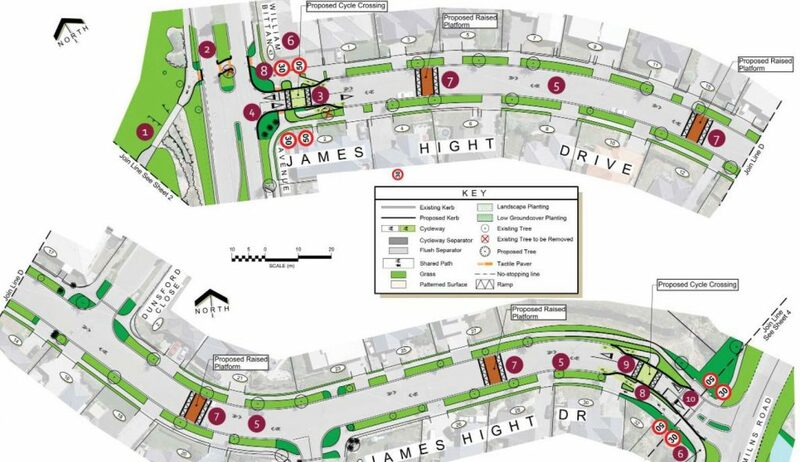 If I had to identify a common theme that still needs work, I think that better connections to/from adjacent streets and destinations (shops/schools/parks/etc) should be worked on; it’s no good having a great facility for going along if it’s not easy to get on or off it. 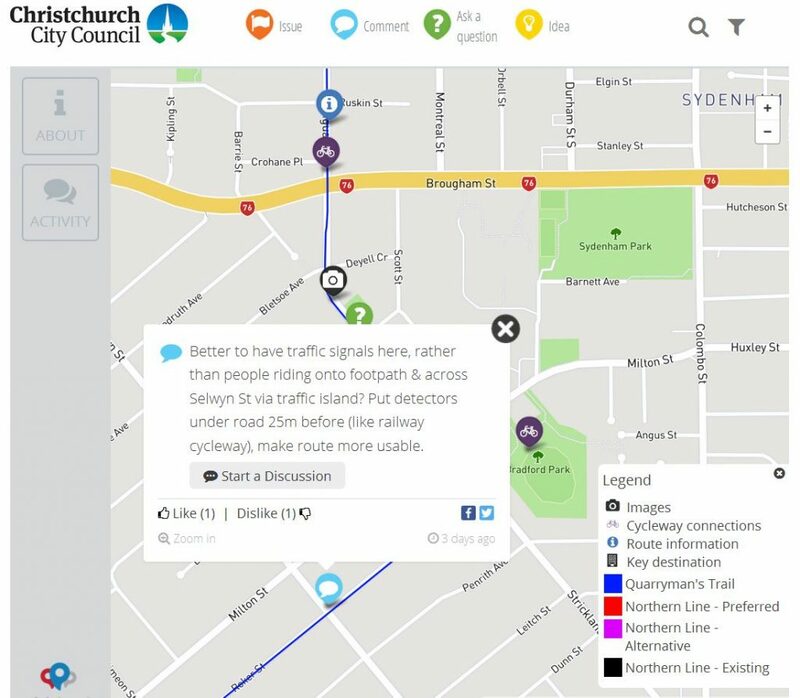 A nifty feature of the consultation process is the introduction of an interactive map of the route, on which you can add your feedback directly at the relevant location. It could be an issue to raise, a question to ask, an idea to suggest, or just a general comment (you can even upload an image of something if it would help). You can also see what others have said and indicate your support or otherwise too. Hopefully this will make it easier for people to provide some input by just clicking and dragging to the appropriate spot and typing a few words (note: you can still do a formal submission in the usual way too). CCC’s interactive feedback map is easy to use – give it a go! Feedback and comments are being sought before 5pm Thu 10 November, so have your say now. You can also discuss plans with staff at the new Te Hapua Halswell Centre (341 Halswell Rd) this Wed 26 Oct between 5:30pm-7:30pm (presentation at 5:45pm). And if you’d like a chance to go over the route and discuss it with others, you could join Spokes Canterbury on a ride from town to Halswell next Sun 30th Oct from 10am. What do you think of the proposed Quarrymans Trail cycleway? It starts to get a bit too far north (and near the Little River Link), but I agree that it’s a handy connection that should still be catered for (e.g. a convenient link off Strickland onto Bletsoe). Is this going ahead? Would have been nice to inform residents on this route directly rather than hiding it away. If it is going ahead when does it start so I know when to sell up. Scheme consultation has only just closed, detailed design will take a few months before it is back with Council. There were a number of public drop in sessions plus pamphlets and all the online info mentioned, hardly hiding it away. Surely this cycleway should terminate at the quarry area- so beloved and used by cyclists? So why not follow Sparks road or veer towards the Quarry rather than away from it. But overall 100% endorsement of initiative! Next Next post: Um, maybe your riding is just… a bit crap?